Database Hosting Service is a service where database hosting provider hosts and manages the database in different hosting environments such as MSSQL, MySQL and Oracle. 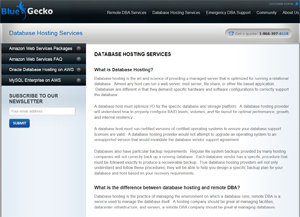 The service API is exposed to the end user, and permits users to perform maintenance and scaling operations on their database instances, creating a database instance, modifying the resources available to a database instance, deleting a database instance, creating a snapshot (similar to a backup) of a database, and restoring a database from a snapshot. 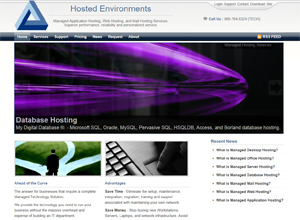 Some dabase hosting providers offer managed database hosting, where they are responsible for installing, updating and fully maintananced database on behalf of the database owner's. Blue Gecko is a world-class Managed Database Hosting Service Provider, committed to managing the complete lifecycle of Client’s Oracle and MySQL database. 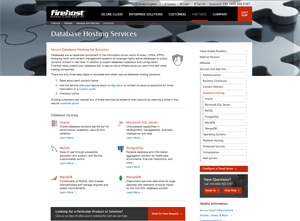 Firehost offers the following database hosting services: Oracle, Microsoft SQL Server, MySQL, PostgreSQL, MariaDB and MongoDB. Firehost provide expert database installation, configuration and support and protect your database with a secure cloud infrastructure you won't find with other hosting companies. Hosted Environments reduces and eliminates the hardware, software, installation, maintenance, security, and support costs of your databases. Fully managed storage, backups, disaster recovery, optimization included. Support for all databases including Microsoft SQL Server, MySQL, Pervasive PSQL, Oracle, DB2, Informix, Microsoft Access and many more.